India is the seventh largest country in the world. It is a union of 28 states and seven territories combined into a socialist secular democratic republic with a parliamentary form of government. India's population in 1981 was 685 million people living in 2,949 towns and 557,138 villages. This is an increase of 25 percent over the 1971 census. Rural population made up 77 percent of the total. In 1981 the literacy rate was 36 percent. Its population in 2001 was 1,029 million people living in 5,161 towns and 638,691 villages. This was an increase of 21.3 percent over the 1991 census. Rural population, in 2001, was 72.2 percent of the total population, and the literacy rate stood at 64.8 percent. From the numerous languages and dialects spoken, 15 have been specified in the eighth schedule of the constitution. In 1987 India was one of the 10 major book-producing countries of the world and ranks third in production of English titles. India expected to achieve available health facilities for all of the people by A.D. 2000. The birth rate was expected to fall to 21 per 1000 and the death rate to 9 per 1000 population by the year 2000. In 1981 the following major religious groups were registered: Hindus, 550 million (83 percent); Muslims, 75.5 million (11 percent); Christians, 14.3 million (2.4 percent); Sikhs, 13 million (2 percent); Buddhists, 4.7 million (.71 percent); Jains, 3.2 million (.5 percent); others, 2.7 million (.4 percent). In 2001 the following major religious groups were registered: Hindus, ca. 828 million (80.5 percent); Muslims, ca. 138 million (13.4 percent); Christians, ca. 24 million (2.3 percent); Sikhs, ca. 19.5 million (1.9 percent); others, ca. 18.5 million (1.8 percent); unspecified, ca. 1 million (0.1 percent). In 1957 there were five distinct Mennonite mission fields in India, all operated by North American Mennonite mission boards. They are listed below with statistical information, in order of origin: (1) Mennonite Church (MC), state of Madhya Pradesh, language Hindi, area 5,000 sq. mi., field population 1,000,000, baptized members 1,500, arrival of first missionaries in India 24 March 1899; (2) Mennonite Brethren, state of Andhra Pradesh (Hyderabad), area 5,000 sq. mi., population 2,500,000, members 23,000, language Telegu, arrival of first missionaries 27 October 1899; (3) General Conference Mennonite Church, state of Madhya Pradesh, language Hindi, area 4,000 sq. mi. (to which a second contiguous field was recently added), population 1,000,000, members 3,600, first missionary arrival 9 December 1900; (4) United Missionary Church, state of Bihar, language Bengali, area 1,500 sq. mi., population 400,000, first missionary arrival 1925, members 600; a second field was opened in Calcutta in 1956; (5) Mennonite Church (MC), second field, state of Bihar, language Hindi, area 4,200 sq. mi., population 1,000,000, members 110, established in January 1940. See the map on the left for locations of the fields in 1957. Thus the five Mennonite missions in India in 1957, after almost 60 years of work, had a total of roughly 29,000 members, three fourths of them in the Mennonite Brethren field. Methods of working included direct evangelism, educational, medical, and industrial missions, and also leprosy work. The three oldest missions were major efforts, each with a staff of 30 to 40 missionaries at their height. The Mennonite Church mission in Madhya Pradesh was terminated in 1952, and the direction of the entire work transferred to the indigenous church, although missionaries were still sent to the field in small numbers. The other missions in 1957 were still operating as American missions, but were working toward indigenization. The General Conference mission took over an adjoining area from the British Baptists. The Mennonite Church, General Conference Mennonites and United Missionary Church cooperated with the Union Theological Seminary at Yeotmal, furnishing certain staff members. For a more detailed account of the several American missions in India see the pertinent articles on the entire missions as well as on the major stations and institutions. In the late 19th century Mennonite Brethren in Russia were interested in foreign missionary work, but they did not have their own mission board. They were sending their mission offerings to the Dutch Mennonite missionary organization for the support of the work of Peter Jansz in Java. They also were supporting the work of the American Baptist Missionary Society in India. The Mennonite Brethren sent their first missionary couple to India (Abraham and Miriam Friesen) from the Ukraine under the auspices of the American Baptist Missionary Society. The Friesens worked in the Nalgonda district of what was then Nizam's State (later part of Andhra Pradesh State). The Friesens were in India until the beginning of World War I (1914) when it became impossible to receive support from Russia. This work was transferred to the American Mennonite Brethren Mission in 1898. From the beginning the various Mennonite and Brethren in Christ missions focused on planting Indian churches which would ultimately become self-governing and self-supporting. The influx of North American missionaries lasted until World War II (1942). The phasing out of foreign missionaries became inevitable then due to the Indian struggle for freedom and the problem of missionary visas after independence in 1947. Almost all of the Mennonite and Brethren in Christ missions began their work with orphanages and other institutions, and they all established mission compounds in which these institutions were located. This created a liability of dependence of the Indian Christians on the foreigners and their boards. The first generation of Indian Mennonite and Brethren in Christ were the founding fathers of the present churches. Without their utter dedication and sacrifices there would not have been any churches. Socially and culturally Indian Mennonites come from the low caste and harijans ("children of God"). For instance the Malas and Madigas in the Mennonite Brethren Church in India are leather-workers, weavers, and entirely landless farm laborers. In the Bihar region the Brethren in Christ Church Society congregations are composed largely of adivasies (aboriginal) marginal farmers. The Bihar Mennonite Mandli membership is drawn from a similar background. There is a closer affinity between Santalies, Oraans, Mundas, and other animist groups who have become Christians in North and South Bihar and the United Missionary Society (Bharatiya Jukta Christa Prachar Mandali) in the Purulia district of West Bengal and the Surguja District of Madhya Pradesh with the General Conference Mennonites (Bharatiya General Conference Mennonite Kalisiya). Caste Hindus were converted in the Mennonite Church in India and the Champa-Korba area of the General Conference Mennonite churches, with a tiny sprinkling of high caste Brahmin. Linguistically the Mennonite and Brethren in Christ churches are a heterogeneous group speaking more than a half-dozen languages and able to communicate with each other only in the English language or limited Hindustani. Geographically they are at great distances, being spread out in four large states of India, namely, Andhra Pradesh, Madhya Pradesh, North and South Bihar and the West Bengal. From the site of the Brethren in Christ worshiping center at the Koshi Barrage at the Indo-Nepalese border to the Mennonite Brethren churches in the Nalgonda district at the Nagarjun Sagar Dam on the River Krishna is a distance of more than 3,500 km. (2,170 mi.). Nearest in respect to location are the Mennonite Church in India and the Bharatiya General Conference Mennonite Kalisiya in Madhya Pradesh at a distance of 150 mi. (240 km.). The Mennonite Brethren Church in India, with a total of 103,840 members in 840 congregations in 2006, was spread out in 10 field associations covering over 2,000 villages. Each field association was further divided into circuits of five to six villages where the local ministers and elders were stationed. Each circuit preacher was responsible for evangelistic and pastoral work. New work in the city of Bombay with the migrant Telegu-speaking people was begun. The Telegu Mennonite Brethren were strongly motivated to field evangelism, and they baptized annually some 300 to 400 non-Christians. The church growth rate was much higher than any other Mennonite group in India. The governing council of the Mennonite Brethren churches was made up of five members from each of the ten field associations who elected the five-member executive committee. The governing council met annually. Mennonite Churches in Madhya Pradesh (Central Provinces) resulted from the Mennonite Church (MC) mission in Dhamtari (1899) and the General Conference Mennonite Church (GCM) mission in Champa (1900). From the beginning the two missions and their missionaries cooperated well. For example, the General Conference missionaries lived in Dhamtari for a year until they could learn the language and locate their own field of service. While the missionaries themselves met more frequently, their Indian counterparts seldom met in a conference or retreats before 1950. The Mennonite Church in India (Bharatiya Mennonite Church in India ki Pratinidhi Sabha) is the official title of the church in the Dhamtari area. It functions under the annual conference established in 1912. In 1987 it had 17 congregations spread out in four districts of southeastern Madhya Pradesh, namely, south of the Raipur district, and in the Durg, Rajanandgaon, and North Bastar districts. But its members were very widely scattered throughout India. The hub of its work was located in the town of Dhamtari, and most of the village churches have become depleted in numbers due to the migration of the second generation of Christians seeking employment in industrial centers. The growth of the church has been sporadic and disappointing. Membership of the church remained at ca. 2,500 since 1950. (In 2003 there were 19 congregations with 3,400 members.) The American Mennonite Mission ceased to exist in 1952, and all administrative responsibilities were transferred to the Mennonite Church in India. The Mennonite Board of Missions (MC) continued to provide personnel and funds (regular monthly budget payments ended in 1975). However, there are new openings where members have moved to other places for work and have established themselves well financially. The Bharatiya General Conference Mennonite Church can be broadly divided into three regions: the Surguja field in the north among the adivasies, the older work in the Champa-Korba and Janjgir-Mauhadih area, and the work in the southern area largely in the Jagdeeshpur-Saraipaalli area. Divisions along regional lines have on occasion been sharp. Those in the south are mostly from the Oriya-speaking group from the older field of the British Baptists and they form a numerical majority. The most encouraging feature of General Conference Church is that it is a growing church. What seemed to be a barren field in the 1940s in the Korba-Champa area in 1987 exhibited growth both in the establishing of new worshiping centers developing into permanent congregations, but also in the expansion of educational institutions. All of the educational work of the church has been registered under a new educational society called Menno Christian Educational Society (January 1986). Under this function three Mennonite high schools (Jantzen School at Jagdeeshpur, 1939; Jyothy School at Korba, 1970; and the Beacon English Medium School at Korba, 1962). Indigenous leadership provides spiritual care and shepherding of the flock in the Korba industrial complex at 8 places of worship. Membership in 1987 was approximately 7,500. In 2003 there were 26 congregations with 7000 members. While the Mennonite Church in India is a member of the National Council of Churches in India and works very closely with Churches Auxiliary for Social Action, the General Conference church is a member of the Evangelical Fellowship of India and works with the Federation of Evangelical Churches of India and Evangelical Fellowship of India Committee on Relief. Both churches have been cooperating in several areas, especially in the translation, publication, and distribution of Vacation Bible School materials published by Herald Press in Scottdale, PA. From time to time the two churches have cooperated in the area of peace literature and education. The Union Bible School at Janjgir was a union institution in which the Dhamtari and Champa groups cooperated. It played a vital role in preparing village preachers. It has become the Union Biblical Seminary at Bibwewadi Pune, Maharashtra State (formerly at Yavatmal). Conference properties for both churches are held by the Evangelical Trust Association of North India. The churches were charter members of the Mennonite Literature and Radio Council (MELARC). At special meetings during conventions and retreats pastors and church leaders from both churches exchange pulpits. Yet there are many unexplored areas for cooperation and the differences are also unique. While the Mennonite Church in India received no grants or personnel from the Mennonite Board of Missions and Charities, the General Conference church received regular funds from the Unites States for nurture and women's work and it still had one foreign missionary family in residence in 1987. Both churches are deeply motivated to remain Mennonite and Anabaptist in outlook and witness. The Brethren in Christ Churches in North Bihar (Bharatiya Khristiya Mandali) were founded in 1914-1916 by Brethren in Christ missionaries in the upper regions of North Bihar. The Koshi River flows down the entire length of the Brethren In Christ mission field. The Koshi is well known as "the river of sorrow" because it keeps changing its course every 10 years. This affected the establishment of mission stations. Small groups of believers are found in Saharsa, Begusrai, Supaul, Madhipura, and Banmankhi. This is largely a Hindi-speaking church with low-caste Hindu background. Rice and jute are the main crops of this area. A new advance was made by the Brethren in Christ churches with the extensive evangelistic work among the Santali people. The advance was so distinctive that the number of Brethren in Christ members in India almost quadrupled to around 1,200 members. The churches are growing in the Banmankhi and Purnea districts among the Santali people through a people's movement and "each-one-win-one" approach of personal contact among friends and relatives. This Santali group finds close affinity with those in South Bihar and, in the Purulia district of West Bengal, with the Bharatiya Jukta Christo Prachar Mandli (United Missionary Church). In 2003 there were 55 congregations with 3,200 members. Bharatiya Jukta Christo Prachar Mandli is the official and registered title of the United Missionary Church in India. The vernacular name literally can be translated as "Indian United Christ Evangelistic Church." The work of this church is under three conferences and in five language areas, namely Hindi, Santali, Telegu, Bengali, and English. It is spread out in Bihar, West Bengal, and borders of Orissa and Assam. It has strong evangelistic outreach in rural areas through Bengal Bible Institute in the Purulia district and Calcutta Bible Institute with its Bible Correspondence School since 1956 reaching out to 150,000 persons. It has made a strong impact on the lives of many people in different stations of life. Total membership is ca. 2,500 in 28 congregations (1987). Denominational headquarters are in Calcutta. The church is affiliated with Mennonite World Conference, although its parent body in North America, the Missionary Church, is not. Bihar Mennonite Mandli is the registered name of the Bihar Mennonite Churches. Mennonite (Mennonite Church) missionaries moved from the Dhamtari area in search of a new field in 1939-1941. The work started by S. J. and Ida Hostetler in the Kodarma area where the Roman Catholics and Lutherans were already working. Later the missionaries decided to move to the Palamau district of South Bihar. The work was mostly in the rural areas and was established with four mission stations, Chandwa, Bethet, Latehar and Satbarwa. With the opening of the Good Books program in Banchi a missionary family (Paul and Esther Kniss) were located in this large city. Mostly the churches are in the rural area and agrarian in nature. A total of 16 small congregations with 800 members existed in 1987. In 2003 there with 19 congregations with 1500 members. This is a homogenous group comprising two tribes (Araon, Munda), and the members' animist cultural background is evident in many social events, e.g., weddings. In partnership with the Mennonite Central Committee the church operates two hostels, (for girls at Latehar and for boys at Chandwa with 30 students). These students attend public schools. Culturally and linguistically this church has more affinity with congregations in the Banmankhi and Purneas districts of the Brethren in Christ Church Society and with those in the Purulia District of the United Missionary Society. 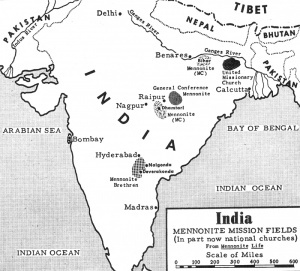 Mennonite Missions in India, 1957. Source: Mennonite Encyclopedia, v. 3, p. 21. The Mennonite Relief Committee of India (MRCI), a precursor to the Mennonite Central Committee (MCC) of India, was organized on 9 April 1942. Mennonite and Brethren in Christ missionaries of the India field met whenever the MCC administrator (Orie O. Miller) came on his India visit. The committee was formed by representatives of each of the five Mennonite and Brethren in Christ missions in India. S. M. King was the first president and P. W. Penner served as secretary-treasurer. They allocated 30 percent of the field remittance to relief and 70 percent for war sufferers. Most of the relief work was carried on by the missionaries. The Bengal famine of 1942 presented the MRCI with a major effort at organized relief work. Milton C. Vogt and A. K. Biswas served as the first relief workers, confronted by the needs of more than 6 million people. Calcutta became the hub of relief activities and the work was carried out by the MRCI until 1944. During the partition of India into Pakistan and India (1947-1948) millions of refugees crossed the borders from the Punjab and West Bengal to find new homes. This was accompanied by much violence. More than a million refugees were temporarily settled in tents on the Ramlilla grounds in New Delhi. At the call of Prime Minister Jawahrlal Nehru a massive relief operation was organized by the National Christian Council of India (NCCI) bringing personnel and supplies from overseas. Mennonite Central Committee flew several million units of penicillin to New Delhi. The Mennonite Relief Committee of India was terminated in 1950 and MCC took its place, with headquarters in Calcutta. E. C. Benedict, a missionary for the Mennonite Brethren in Christ (United Missionary Church) at Balarampur, was the first MCC representative and also served as liaison with the Committee on Relief and Gift Supplies of the National Christian Council of India. For sometime MCC's work was confined to Calcutta and its suburbs giving medical aid and establishing poultry projects. 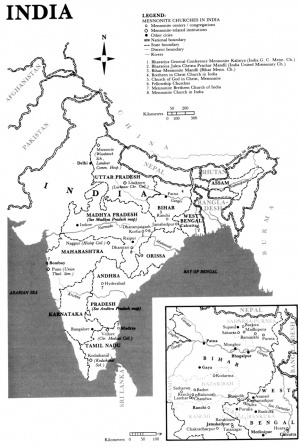 In 1962 a regional office was set up in Calcutta to administer MCC programs in India, East Pakistan (later Bangladesh) and West Pakistan, Afghanistan, Nepal, and Ceylon (Sri Lanka). In 1963 the Mennonite Christian Service Fellowship of India was organized (P. J. Malagar director) to assist MCC in disaster relief, voluntary service, peace education, and inter-Mennonite fellowship. Together these organizations assisted in Chittagong in East Pakistan in 1964, flood relief in the Midanpur District of West Bengal, refugee work in Bangladesh together with Bengal Relief Service (World Council of Churches), and other relief agencies. The MCC office was active in organizing the Evangelical Fellowship of India and helped this agency in refugee relief in the Dum Dum area. When Bengal Relief Service was active in Shyamnagar in a refugee housing project MCC volunteers lived in the housing colony and engaged in community health, fisheries, and poultry work. The medical programs of Bengal Relief Service were eventually turned over to MCC and MCSFI. Together they formed a board to administer the Shyamnagar Christian Hospital. Mennonite Central Committee was also heavily involved in the development of water resources and with Action for Food Production to counteract the recurring drought and monsoon flooding. Well-drilling machines were imported and small dams were built. Drought relief was also intensive in the MCSFI constituency. Other regular MCC programs include the Ten Thousand Villages artisan program, educational aid, vocational training, and cooperation with the following development agencies in the MCSFI constituency: REACH (Rural Economic Development and Community Health Association) at Jagdeeshpur, Madhya Pradesh; MADRA (Mennonite Agricultural and Development and Relief Association) at Dhamtari, Madhya Pradesh; MBDO (Mennonite Brethren Development Organization in Jadcherla and Mahhubnagar in Andhra Pradesh; MSA (Mennonite Service Agency) in Chandwa, South Bihar; BICDS (Brethren in Christ Development Society) at the Bammankhi-Purnea area of North Bihar; and CHERRADA (Community Health Employment Relief Relief Development and Agriculture) at Ambikapur, Madhya Pradesh. Both cash and grain for Food for Work projects (building roads and dams and digging wells) are supplied by MCC. See also All-India Mennonite Women's Conference; Bharatiya General Conference Mennonite Kalisiya; Mennonite Church in India. 1Statistical information for the Conference of Mennonite Brethren Churches in India for 2003 was used in the 2006 report compiled by the Mennonite World Conference. Information for 2012 was taken from The Mennonite Brethren Church Around the World: Celebrating 150 Years, edited by Abe J. Dueck and published in 2010. Buckwalter, Leoda. Silhouette: Colonial India as We Lived It. Nappanee, IN: Evangel Press, 1988. Building on the Rock. Scottdale, PA, 1926. Dueck, Abe J., ed. The Mennonite Brethren Church Around the World: Celebrating 150 Years. Kitchener, ON: Pandora Press; Winnipeg, MB: Kindred Productions, 2010. Engle, Anna R. John A. Climenhaga, and Leoda A. Buckwalter. There Is No Difference. 1950. Esau, H. T., Mrs. First Sixty Tears of Mennonite Brethren Missions. Hillsboro, 1954. Esch, C. G. Fiftieth Anniversary Souvenir Booklet, 1906-1956. Elkhart, IN: Mennonite Board of Missions & Charities, 1956. Good, Mary M. The Mennonite Church in India. Elkhart, IN: Mennonite Board of Missions & Charities, 1955. India Mennonite Brethren Church at Cross Roads. Governing Council of the Conference of the Mennonite Brethren Church of India, March 1972. Janzen, A. E. Survey of Mennonite Brethren Missions. Hillsboro, 1950. Kaufman, Ed. G. The Development of the Missionary and Philanthropic Interest Among the Mennonites of North America. Berne, 1931. Khaka, Sushil. Unpublished manuscript on Bihar Mennonite Mandli. Kraybill, Paul N., ed. Mennonite World Handbook. Lombard, IL: Mennonite World Conference, 1978: 122-144. Lapp, G. J. Our Mission in India. Scottdale, PA: Mennonite Publishing House, 1921. Lehman, M. C. Our Mission Work in India. Elkhart, IN, 1939. The Love of Christ Hath Constrained Us. Scottdale, PA, 1949. Malagar, P. J. Mennonite Christian India. 1981. Mennonite World Conference. "2000 Asia/Pacific Mennonite & Brethren in Christ Churches." Web. 2 March 2011. http://www.mwc-cmm.org/Directory/2000asiapacific.html. [Broken Link]. Mennonite World Conference. "Mennonite and Brethren in Christ Churches Worldwide, 2006: Asia & Pacific." Web. 2 March 2011. http://www.mwc-cmm.org/Directory/2006asiapacific.pdf. [Broken Link]. Mennonite World Conference. World Directory = Directorio mundial = Répertoire mondial 2012: Mennonite, Brethren in Christ and Related Churches = Iglesias Menonitas, de los Hermanos en Cristo y afines = Églises Mennonites, Frères en Christ et Apparentées. Kitchener, ON: Mennonite World Conference, 2012: 9-10. Mennonite World Handbook Supplement. Strasbourg, France, and Lombard, IL: Mennonite World Conference, 1984: 27-32. Moyer, S. T. With Christ in the Edge of the Jungles. Berne, IN, 1941. Peters, Gerhard Wilhelm. The Growth of Foreign Missions in the Mennonite Brethren Church. Mennonite Brethren Board of Foreign Missions, 1947: 27-88. Ratzlaff, R. Fellowship in the Gospel in India, 1900-1950. Newton, KS, 1950. Sarkar, Pronoy. "A Memorandum prepared for the Missionary Church International Conference of Presidents, Family Life Center, La Vega." 5- 12 September 1986. Storms, Everek Richard. History of the United Missionary Church. Elkhart, IN: Bethel Publishing Company. 1958:233-49. Storms, Everek R. What God Hath Wrought, The Story of the Foreign Missionary Effort of the United Missionary Church. Springfield, 1949. Twenty-Five Years with God in India. Berne, IN, 1929. Malagar, Pyarelal J., John Thiessen and Harold S. Bender. "India." Global Anabaptist Mennonite Encyclopedia Online. May 2014. Web. 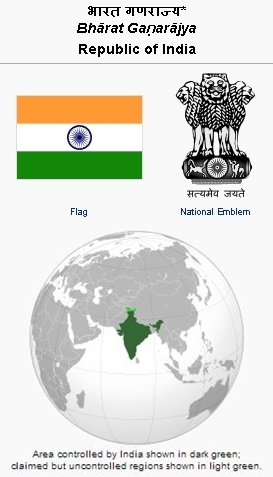 19 Apr 2019. http://gameo.org/index.php?title=India&oldid=130692. Malagar, Pyarelal J., John Thiessen and Harold S. Bender. (May 2014). India. Global Anabaptist Mennonite Encyclopedia Online. Retrieved 19 April 2019, from http://gameo.org/index.php?title=India&oldid=130692. Adapted by permission of Herald Press, Harrisonburg, Virginia, from Mennonite Encyclopedia, Vol. 3, pp. 21-22; vol. 5, pp. 422-427. All rights reserved. This page was last modified on 11 February 2015, at 00:36.